This review is about item#75175247. Happy in the middle that is about the inside hurts. This review is about item#75175265. This review is about item#75175274. Built as disaster prevention goods (for wife). It will take time to make it a helmet, so training will be required from day to day. If you get into a mechanism like a one-touch umbrella you may feel a little more sense of security. The first impression is a good impression because it is in the shape of a helmet properly. When I tried to install it, it was small, there was a feeling of incompatibility sitting on my head slightly disappointing. However, thinness when folded is good as entering business trip for business trips on a day trip. I am a little worried about the durability of foldable parts, but I think I will use it in the future. I hope to make the head fits comfortably like a general helmet even a little oversized, so that it gets thinner when folded a little more. 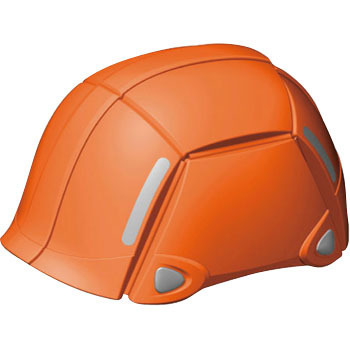 In case of an emergency, a normal helmet has a sense of security, but even if it is necessary as a rule of the construction site, even if there is no danger, such as for preview only at the site or for presence for management, , Much less it is not a car, in the case of a handheld movement, it can not be fitted in a business trip bag (bulky), so it is handy to say foldable. When it repeats assembly and storage it will surely go sweeter in terms of strength, but because the deterioration deadline of the original helmet is 3 years, it is not worried so much. I bought an equivalent product called Tatamet before but was not in the shape of a normal helmet, so I had resistance and never used it. I feel that it is okay with no ordinary sense of incongruity for this amount of wearing. This review is about item#75175256. Disaster prevention for folding helmet "Tatametto BCP"